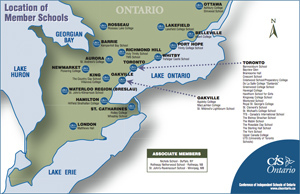 Founded in 1829, Upper Canada College is a leading independent school for boys SK- Grade 12, located in the heart of Toronto. The College presents a rigorous, liberal education through the International Baccalaureate Programme and broad co-curricular opportunities to engage students, faculty and staff. Our students are motivated and supported by a well-resourced, exceptional faculty, who bring a diversity of experience to an exemplary professional learning community. The College also emphasizes a balanced education, one that breeds character as well as academic excellence. We seek to prepare students to make their mark in an increasingly global village. The Prep School at UCC is currently inviting applications for a dynamic, energetic and experienced Grade 6 and 7 Math teacher and Form Advisor (homeroom teacher), who thrives on working in a collaborative and fast-paced environment. As the College moves towards its 200th year, the roles mandate is to ensure that the values and principles of UCC’s Strategic Directions and the International Baccalaureate are at the centre of learning and the building of relationships with colleagues, parents, and students. The successful candidate will have demonstrated experience in teaching, an understanding of, and sensitivity to, the way in which today’s boys learn, and an ability to work in a collegial, transparent and humble manner. The successful candidate will have demonstrated experience in using reflection and feedback to improve his/her teaching practice. In addition, he/she will be up-to-date on current curricular trends, be tech-savvy and involved in education beyond the classroom. Collaborate with colleagues within the department and beyond, with humility and openness to feedback on all aspects of the role, from students, parents and colleagues. Participate fully in all aspects of Norval Outdoor Campus programming. UCC students benefit from a robust co-curricular program including athletics. Many teams have the opportunity to participate in weekend and CAIS tournaments. Some CAIS weekend tournaments are out of province. Display enthusiasm and a desire to participate fully in the UCC community. Please apply online by creating a “Teachers” profile account by Friday, February 22, 2019. We thank all candidates in advance; however, will contact only those selected for an interview. We are an Equal Opportunity Employer and value diversity, encouraging applicants from all qualified individuals. If you are contacted by UCC regarding a job opportunity, please advise us if you require any accommodations.